The Seafarer, Conor McPherson’s Olivier Award-nominated play that premiered at the National Theatre in 2006, imagines the plight of humanity as that of lonely sailors lost at sea, teetering on the safe, dry deck of morality above treacherously immoral waters. No matter how far you roam, the Devil that is your sins of the past can always find you. Walking on water isn’t a foreign concept to celestial entities. A reckoning will come, and spiritual debts must be paid. The Irish Repertory Theatre’s revival in New York clearly understands the importance of this potent metaphor. As McPherson’s ragtag bunch of working class alcoholics regale each other with chronicles and complaints — a classic Irish stew — in a disheveled living room in a suburb of Dublin on Christmas Eve, Ryan Rumery and M Florian Staab’s sound design pipes in sounds of a rickety ship struggling to stay afloat. Or, is it already underwater, and those echoes are the splintering of the wood under the weight of the universe’s merciless gravity? Does any regular mortal have a chance of living a life above the grasp of the devil’s lair, or are we all sunk already? The Seafarer is clearly enamored with theatricalising ideas — the Devil literally makes an appearance, here played by Matthew Broderick — but those responsible for this production probably didn’t intend for their work to reflect a forgettable ride out to sea. Failing to tap into the tumultuous nuance of McPherson’s text, this production merely sails along its surface, breezing along on the strong winds of McPherson’s propulsive writing but rarely plumbing the thematic depth of his ocean of words. McPherson’s oratory-style dramaturgy requires meticulous performances to turn the tidal waves of dialogue the actors spew into fully-fleshed characters. Lacking performative specificity, the ensemble’s broad characterizations make their characters nothing more than vehicles for dialogue expressing a range of generalised emotions. Under Ciarán O’Reilly’s formulaic direction, their monologues start to sound less like windows into their psyches — and, for that matter, into the play’s themes and even its basic story — and more like dense blocks of letters haphazardly flung at the audience. This approach, especially since it’s the primary means of communication throughout, results in lulling the audience to sleep, preventing them from engaging with the script’s many layers. The most superficial and least fluid member of the cast is also the bloke everyone wants to see. Matthew Broderick’s sensitively boyish disposition is a far cry from the intimidatingly imposing natural presence of Ciarán Hinds, who originated the role. Someone unfamiliar with Broderick’s recent stage work may confuse his take as, well, a take. But it’s become his fallback persona lately, never varying to suit any one part. He’s basically just playing Matthew Broderick, albeit with a laughably stereotypical Irish accent. And modern-day Matthew — from his static, apathetic demeanor to his line deliveries that sound like line deliveries being read directly from the script — seems like he views acting as simply a way to pay the bills. McPherson and The Seafarer deserve better. 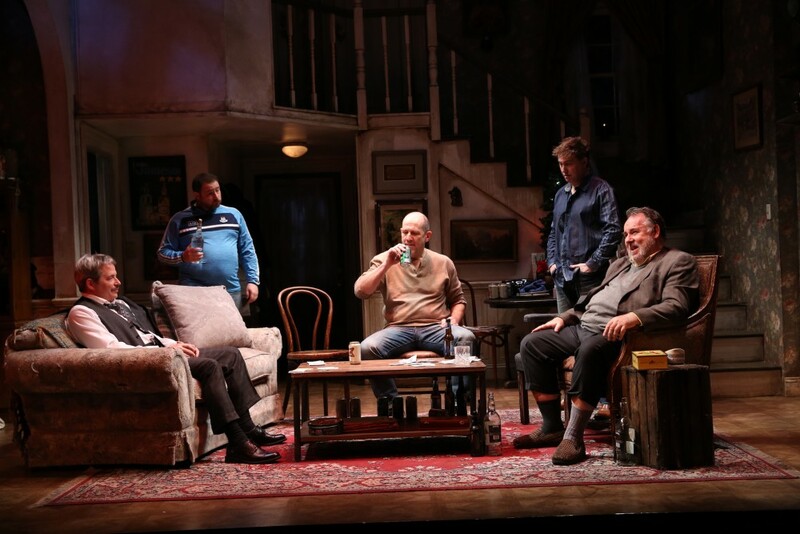 The Seafarer runs through 24 May. I doubt that Mr. Broderick needs to appear at the Irish Rep in order to “pay bills”. He has used off-broadway in recent years to take on roles that are against type. I saw this production and thought it was first rate, including Broderick. I don’t compare productions to each other since they are not the same in either direction or acting. Assuming he’s been smart with his finances over the years, I agree that he doesn’t NEED the Irish Rep to pay the bills. But his recent performances just feel like he’s going through the motions, putting little heart or thought into each, thus the reason they all seem so similar. It’s legitimately great that he’s taking on roles against type; my problem is that he doesn’t vary the type of performance he gives for each. In that sense, I do think it’s helpful to compare HIS productions. My only direct comparison with THE SEAFARER’s original production was mentioning Ciarán Hinds, because Broderick’s take on the role was vastly different. I’d be more inclined to laud that change if it was deliberate. But since Broderick merely adopted his usual persona that he’s deployed in most (if not all?) of his recent work, it felt less like a interesting choice on his part, and more of, well, more of the same. In any case, I’m glad that you enjoyed the revival; I wish I had as well. Regardless, thanks for reading and engaging!